Our extensive Broadcast product line-up includes JVC, Sony Broadcast and Panasonic for cameras, along w/ Ross Video, NewTek, Broadcast Pix and Blackmagic Design for video switchers. When it comes to terminal gear and test equipment, we’re proud to offer products from AJA Video, Imagine Communications and Tektronix. And with all of this gear, you have to talk to your crew, and as the regional Eclipse dealer for Clear-Com, we can offer the intercom systems that enables IP and wireless communications. SAV has the staff and experience in the Broadcast arena to be your partner when it comes to sales and systems integration for your facility, so let us be your Broadcast provider, to get your message delivered thru any and all channels desired! 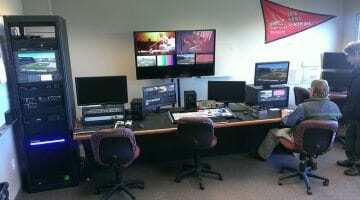 Springfield Cardinals featuring NewTek Tricaster 8000, 3Play, Sony and Panasonic Cameras and Blackmagic Design routers. 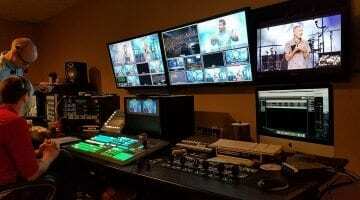 James River Church Control room, featuring Ross Video switcher and Panasonic HD Cameras.